The Misfit Ray's unusual looks will appeal to some, but it's severely limited in terms of functionality – not least because of the almost non-existent display – and struggles to justify its price tag. 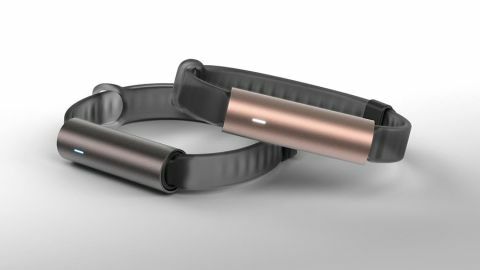 The Misfit Ray is a style-obsessed fitness tracker. It wants to be thought of as a piece of jewellery as much as a piece of tech. As a result, though, it's fairly expensive for what is a rather basic device. It costs £79, $99, AU$135, so while it's cheaper than your average Android Wear watch, it arguably does a bit less than the cheaper Fitbit Flex. The first thing to get your head around is that the Misfit Ray does not tell the time. With only a single tiny little multi-colour LED on its front, a watch face simply isn't an option. Let's take a closer look at what the Misfit Ray is made of. Its body is an aluminium tube, the straps a translucent rubbery silicone. The tube is no mere style offering, though. Twist around one of the sides of the strap and the battery compartment pops out – this holds three 393 cells, and takes up a decent amount of the space in the tube. The Misfit Ray looks different – bold, even – but my honest first reaction was that it also looks a bit like something you might have to wear after a stint in prison; thankfully, though, an alarm doesn't sound when you take the Ray off your wrist. It's also only halfway there in terms of comfort. Issues with wearables tend to centre around weight, skin-irritating straps and flat-out poor ergonomics. The Misfit Ray is pretty light, and the thin strap feels fine, but unless you like your watches quite loose the main 'barrel' just isn't that comfortable. As there's no curvature to its length, no flattening-out of its bottom, the surface area that actually rests against your wrist is quite small – and after a couple of days it had given me a sore wrist, apparently lightly bruising the top tissue. This can be avoided by loosening the strap, but it's a clear sign that the Ray is ergonomically poorer than something like the Fitbit Flex or Sony SmartBand Talk SWR30, both of which are designed to follow the contours of your wrist, not actively disregard them. As you can probably tell by now, I'm not in love with the Ray's design. I like the bronze-inflected anodised finish to the aluminium, but that aside it feels a lot like strapping an AAA battery to your wrist. However, I do appreciate how different it is to your everyday tracker. The Misfit Ray is a rudimentary fitness tracker. It only really has three bits of important hardware at its disposal: a three-axis accelerometer, a Bluetooth connection and a vibration motor. These are at the heart of everything the Ray can do – and they reveal its limitations. The Ray can track your steps, it can track your sleep, and it'll buzz you to let you know you've received a call or text. Note, though, that it is just calls and SMS messages on the notifications front – nothing else. As someone who tends to use WhatsApp rather than SMS texting, the alerts are largely useless. One of the neatest features of the Ray – in theory at least – is that it'll wake you up with a 'buzz' when it thinks you're in a light part of the sleep pattern. This didn't always work for me, however. On a couple of occasions I've been woken by my regular phone alarm rather than the Ray, either because the vibration alarm failed to wake me up, or didn't go off at all. And if I was using the tracker longer-term it'd probably end up on the bedside cabinet anyway. It's bigger than it appears in some photos, and bear in mind that the cylinder part sticks out from your wrist by a good inch. The Misfit Ray doesn't have an altimeter, a heart rate sensor or GPS, which means it can't accurately track your runs or hikes, and can't differentiate between you walking up stairs or on flat ground. On the fitness front, then, it's a pedometer, and little more. What elevates it above the sort of pedometer you might get at Poundland is the software. Misfit has a slick-looking app (iOS and Android) that keeps track of your activity across the days, weeks and months. Rather than focusing on the exact number of steps you've done the app has its own points system, making you work up to 1,000 points each day. I much prefer looking at number of steps when that's the only recorded metric, and the app tells you this too, as well as the estimated distance you've covered. As with any wrist-worn tracker, don't expect great accuracy from the Misfit Ray. The issue is obvious: we don't only move our arms when we walk/run. Trackers like the Ray use algorithms to try to discount this sort of movement, but the Ray's isn't all that clever. As a test I thought I'd see how many steps the Ray registered while I was rooted by to my chair, working – in about 20 minutes it had tallied 32. Where trackers like the Misfit Ray can be useful is for making you a bit more mindful of when your couch potato backside starts sprouting roots. In the Misfit app you can set the watch to give you a buzz when you've been sedentary for too long. Of course, you can get your phone to do the same thing, but it may prove useful for those in office jobs who don't keep phone in pocket all day. You can also tap the Ray to have the LED indicate how near your daily target you are. For a bit more impetus to get off your backside, there's a social side to Misfit. You can compare your 'points' to those of Misfit-owning friends. That's only useful if you have some of those, of course, but Misfit can also hook up with Google Fit, the default Android fitness software if you have an Android phone rather than an iPhone. I enjoy low-level fitness tracking. It's fun to see how much you actually move during the day, and how far you really walked that Saturday you spent schlepping around the museum. However, it's not useful beyond that; if you're training for a marathon (or even just a 5K), a GPS watch offers far more useful data. Sleep tracking, as is generally the case, doesn't really offer much beyond the satisfaction of curiosity either. You get a graphic of bars that show you when you're in periods of light and deep sleep, and when you woke up completely. The Ray only needs the accelerometer for this, because it's all based on how much you move. One feature of the Misfit Ray you might not like is that you have to manually sync the tracker to get an update on how you're doing – your phone and the band aren't constantly talking to each other. To do this you pull down on the screen in the app. For a tracker that wants to earn some attention, it may surprise that it actually wants to be ignored most of the time. This lazy approach to syncing is used because the Ray has non-rechargeable batteries rather than a more usual li-on cell, and they need to last as long as possible. The three 393 batteries are effectively little, but thick and stubby, watch batteries, and are easy to replace. These are meant to last up to six months, and will cost you around £6/$10 to replace. However, I'm almost certain this figure doesn't take into account using the Ray for frequent vibrate message alerts; a little vibrate motor will use a reasonable amount of energy if it's firing off 100 times a day. Either way, battery life is far longer than 95 percent of trackers – although bear in mind that this is a display-less, clock-less device. The Misfit Ray works with Android phones running Android 4.3 or newer, and iPhones on iOS 7 or newer – if you're running something older, maybe upgrading your phone should be a higher priority than buying a Ray.